Malaria is one of the world’s most serious health problems. No single approach has yet to fully conquer either the disease or the disease vector, the mosquito. 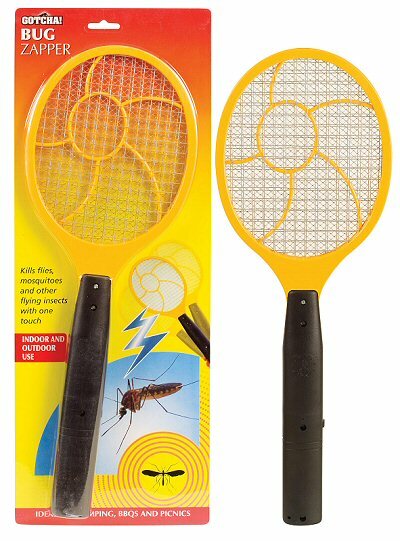 The most common electronic means of killing mosquitoes, the “bug zapper” is not particularly effective. Using lasers to kill mosquitoes has previously been thought of as completely ridiculous. Now the concept is being taken seriously. Now the concept is being taken seriously. Why? An incredibly effective mosquito killer has already been invented. These things are amazing. Well I had the impression, fshgrl, that the issue wasn't efficacy but rather cheap efficacy. At $250 a pop for those mosquito killers (and I imagine you'll probably need more than one per village), they're significantly harder to distribute than the mosquito nets that run at something like $3-4 each while protecting the entire family. Not sure how much more financially viable lasers would be, but it's good to check out all the options nvertheless, eh? Going after mosquitoes (and hell, ants, bedbugs, and cockroaches) is the kind of thing that I think "nanobots" would be good for. But really you don't even need nanoscale technology, just dime-size components big enough to hold sufficient propulsion, sensors, logic, and power. Going after cockroaches would be a good start. Surely all those "Battlebots" inventors could at least try to get cracking and invent a fist size car to patrol the kitchen at night. There's a fortune to be made. I loved it when Bill Gates released mosquitos into the audience, saying "There's no reason only poor people should get malaria." There is nothing like flying into a jungle filled foreign country tripping from your malaria meds though, do we really want to get rid of that? How could anyone think of using a laser to kill anything as ridiculous? Have these people never seen a James Bond movie? Do you expect me to stop spreading deadly disease, Mr. Scientist? There are definitely folks out there working on it. Those lasers probably only work if you mount them on a sharks head. Hilarious star wars send-up aside, nothing that requires a constant supply of electricity is going to do anything at all to prevent malaria. And Phire, I've been living in Ghana for over a year now, and sadly very few people make use of (readily available and and relatively cheap*) nets. I know only a handful of Ghanaians who use them, slightly more who use them for their babies. According to this New Yorker article (abstract), by working to get DDT banned, Rachel Carson holds some responsibility for the current malaria epidemic. The solution to malaria is money. How much money does a company make when it spends a lot of money to come up with a very popular drug (Viagra, for example)? That's the kind of reward that should be offered for the invention of an economical, effective malaria vaccine. Start a fund with international aid money, let it collect interest, and keep throwing money into the pot. Maybe there are such funds, but they aren't big enough or we'd be hearing about the race for the fantastic malaria vaccine prize. It has to be billions of dollars. That Rachel Carson story is an old one and has been pretty comprehensively debunked. For one thing, while DDT was banned in the US, it was not banned worldwide. Rachel Carson could plausibly be blamed for a US malaria epidemic, if one existed. If only we could salt the world with perchlorates, we could cure malaria. Of course, we'd kill off all other life, too, but then who needs the Rachel Carsons of the world to tell us how to think? Excellent. I fantasize about laser-based mosquito defense every time one gets into the house. I'm glad to see our country's rocket scientists are on top of it. Though I, like everyone else, have a hard time seeing how this could really affect malaria in the poorest regions of the world, it's still interesting research, and it's not like the less-poor regions of the world don't have mosquito-borne diseases too. In the Virgin Islands malaria is fairly rare but dengue fever is still pretty widespread and the mosquito population is thick. These things are amazingly effective on individual mosquitos. We keep one in each room and every night before bed we make a sweep of the bedroom. The number of bites I wake up with has decreased dramatically. Any laser strong enough to zap a mosquito would probably be strong enough to cause permanent eye damage. On the other hand, when I was young I used to imagine how I could booby trap my room to protect myself from ninjas (probably a result of reading the novel The Ninja and having an overactive imagination). Turn the power up on one of these babies and it would do the trick, as long as I always remember to wear my computer ID bracelet to I don't get zapped by my own petard. Here's a laser that could wipe out a few mosquitoes. I worked for a small-scale county mosquito control program in Virginia a couple years back. Most of our work centered around monitoring for West Nile Virus in mosquito populations, but we did a fair amount of population control as well. The thing about this laser system and the CO2/vacuum device to which fshgirl linked is that they're tantamount to swatting mosquitoes in mid air, which is to say that they're really only good at maintaining a perimeter, doing relatively little to put a dent in the population. This is the same problem with a lot of insecticide spraying as well. It's like the Manginot Line: the bugs just fly around it. A smarter public health official goes after the mosquitoes at their most vulnerable and population-dense larval stage. Female mosquitoes lay egg rafts in standing water that can produce between 50-300 mosquitoes in less volume than that of a soda cap. It just so happens that a naturally-occurring soil bacteria, bacillus thuringiensis serovar israelensis, or Bti, prevents larvae from developing to adulthood, killing off untold thousands in every treated birdbath and flowerpot. Did I mention that its toxicity is almost completely specific to mosquitoes? Half of my job at the Health Department was throwing packets of Bti in city stormdrains, passing them out to residents who call with complaints, and counseling folks on how to treat or get rid of standing water on their property (corrugated drain pipes, by the way, are like little mosquito tunnels of love). Of course, this was a stateside, mostly suburban program in an area where Malaria was not endemic. For much of the developing world, these large-scale treatment programs are tough (just try getting rid of all the standing water in a slum), meaning that insecticide-treated bednets and indoor residual spraying are the only real options. Interestingly enough, giving the bednets out seems to have a lower success rate than selling them at a nominal fee and using social marketing techniques. Many of the free nets end up being used by fishermen. But I digress. What I'm really trying to say is: 1) dump your standing water, 2) treat with Bti any water that must stand, and 3) if you're traveling to an endemic area, TAKE YOUR ANTIMALARIALS. carmen: "Hilarious star wars send-up aside, nothing that requires a constant supply of electricity is going to do anything at all to prevent malaria. And Phire, I've been living in Ghana for over a year now, and sadly very few people make use of (readily available and and relatively cheap*) nets. I know only a handful of Ghanaians who use them, slightly more who use them for their babies." So then aside from the funds that would ensure the spreading of nets, what else can be done? Why don't people want to use them? The CO2/vacuum thing is, as I understand it, more effective than swatting 'em out of the air because the pesky critters 'smell' the CO2 as a meal and so are drawn to it. They can't help themselves, they go looking for a tasty treat and instead are sucked into a catchment and die die die you itchy little fuckers. Why don't people want to use them? In short, they're hot. A lot of people live in a single room, or a few rooms, that have very little ventilation and may have two adults and multiple kids in them. Adding another layer of barrier between you and the faint breaths of air that come through the window can be agonizing. I am lucky enough to have a well ventilated room and a ceiling fan, so its usually fine. But on hot nights when the electricity goes off, I totally understand where people are coming from. There's also a tendency, in Ghana anyway, to label any sickness 'malaria'. On top of that, adults who've survived multiple bouts of malaria often experience it as a more mild illness than its fatality rates might suggest. So these things combine to make malaria seem like not that big a deal to people who've been living with it all their lives. I'm not really qualified to say but I'll go ahead and hazard some guesses. Standing water is a major problem. There are a lot of small streams that get sluggish in the dry months, as well as open sewer/drains, and a lot of stuff kept outdoors that can collect water. So educating people about the issues of standing water and freeing up some money for the governments to invest in an infrastructure of covered drains and sewers might be some things that could be done (I don't think the education will work without the infrastructure: Ghanaians aren't dumb. They can look along the roadside and see that there is enough standing water in the drains that it doesn't really matter if there is a can or two in their yard collecting the rain). Education about nets and what they do helps though; the people I know who use nets are ones who understand the risks and causes of malaria pretty well. Effective, quick, cheap testing for malaria, maybe, so that doctors could stop over-diagnosing and mis-prescribing and/or more doctors so that they are more able to put time into dealing with the numbers of people who need their help. No easy answers that I can think of. I saw the mosquito fly in front of me, then I didn't see anything at all. The mosquito magnets I linked to are incredibly effective at clearing an area up to a half acre or so. A few per village would do a lot. fshgrl- the problem really breaks down to cost. $1500 for 6 of those things to cover a small 3 acre village (even less, because you want overlapping coverage areas). But then you need to keep them fueled, so ontop of the $1500 up front expense, there is the even greater expense of keeping a solid supply of propane going, which in most developing countries is a rare commodity. And are you going to go to a group of people, who have already adjusted to living with malaria, and tell them that the propane you are giving them is just for malaria prevention, and no they can't use it to have a warm meal? Or to boil water to sanitize it? A 40lb bag of BTI which can cover 4 acres for 30 days is $159. And that is commercial resale cost, not bulk distribution. And assuming a very heaving coverage / dosage per acre, when in most arid climates you just need to target the marsh and specific standing water areas. And it cuts the lifecycle of the mosquitos, not just reducing the adult numbers. And $1500 goes a long way towards putting in a playpump well pumping system for the same village, and give them a fresh, year round supply of water, which would minimize the need for collecting water in open cisterns and vats, which would also reduce the overall mosquito population. As for the bug zapper itself? I think it is very neat, and would be a good system compared to the propane and chemical setups, because in theory you could just attach it to a solar array and let it guard a village. But then imagine what you could build for the same village for the cost of the solar arrays alone. Or what they could have if you just gave them the solar arrays to power an irrigation system so they can have a steady crop supply even during draught conditions? Forget about mosquitoes. This thing could keep a cat entertained for YEARS. Around half of Ghana's population lives in an urban environment, and this is very much the trend in Africa in general. The city I live in is over a million people, and is pretty spread out. It would take a massive influx of capital to provide enough of the magnets for this kind of area. The expense and logistics to use these for effectively controlling malaria (as opposed to mosquitos as simply pests) seems to me to make them unrealistic. I think MrZarquon has really hit on an important point in that given that kind of expense, people will probably prioritize other things, like bore holes or hospitals, over mosquito control. My dad always took a preventative stance, pouring motor oil into standing pools of water. My 7 year old inner-environmentalist always cringed at that. Here are some projects I think are examples of what the focus really can be about when designing to truely help increase the standard of living: the Rocket Stove, the Clay Fridge, and the Clay Water Filter.